Adult bottlenose dolphins range in size from 6 to 12.5 feet in length and from 300 to 1,400 pounds in weight. There are differences in average dolphin size, depending on where they live in the ocean. Dolphins living in the coastal waters of Florida tend to be smaller than those living in deeper parts of the ocean. These different types of bottlenose dolphins are called "eco-types". These eco-types also have some physiological differences. For instance, the composition of their blood is different, probably due to the need for dolphins living in deeper parts of the ocean to dive deeper. In the wild they live to an average of 25 years if they survive the first 12 months after birth. A 30% mortality rate exists in these first few months due to pollution, boat strikes, parasitic and other infections, abandonment by its mother, inappropriate fishing practices and predation by tiger and bull sharks, their chief ocean enemies. In captivity, they have a longer life span. Female dolphins tend to live longer than males. Nellie, a female dolphin born at Florida's Marineland Dolphin Adventure on February 27, 1953, recently died at age 61. She is believed to have been the oldest Atlantic bottlenose dolphin born in captivity. Amazingly, Nellie lived an estimated 36 years past the expected dolphin lifespan. A barely visible vertical ear slit may be seen behind each eye. The dolphin has no external ear so as to avoid the resulting drag or resistance when swimming. Although the dolphin has small external ear openings, they are not connected to the middle and inner ears and appear not to be involved in the process of hearing. The eyes are located to each side of the head and are able to operate independently of each other. Since they are located on the sides of the dolphin's head, they have both monoscopic (able to process 2 images at the same time) and stereoscopic vision (able to see in 3D). The eyes focus in at about 3-5 feet ahead. They have blind spots above and directly behind them, as well as directly in front of their rostrum. Glands at the corner of each eye provide lubrication to wash away parasites and debris as well as provide further streamlining for lower drag while swimming. The eye contains specially adapted muscles to change its shape when adjusting to seeing objects below water versus above water. The skin of a dolphin lacks sweat glands and is 10-20 times thicker than the skin of land-dwelling mammals. The top layer of epidermis is thin and consists of cornified cells. This layer sloughs off easily and is quickly replaced. This process of skin sloughing provides a continuous "smoothing" process so that the dolphin's body is less resistant to contact with water molecules as it swims. The remaining epidermis is quite thick. Micro dermal ridges are present on the dolphin's skin surface. These small ridges trap water molecules as the animal swims. Thus, the liquid trapped on the skin surface allows the animal to pass through the water more easily than if the same animal had a dry skin surface. The understanding of micro dermal ridges is now being used in the building of racing boats, the manufacture of wet suits, and for swim suits used in competitive swimming. In this video, the tactile nature of the dolphin is used to communicate with the animal. 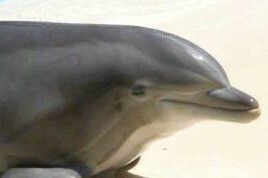 Sensitive areas of a dolphin’s body, those near the blowhole and around the eyes, are usually avoided during training, unless specific training is being targeted for the blowhole area. Just below the surface of the skin lies a 0.75 to 1.5 inch thick layer of blubber. Blubber contributes to this contoured shape and adds to its smoothness. Blubber helps in the conservation of body heat when in cold water, and as a food reserve when the dolphin's food supply is limited. Buoyancy, a big advantage to marine mammals, is provided by the blubber. This buoyancy counteracts gravity which would pull the dolphin downward, allowing it to swim with less effort than an animal lacking buoyancy. It takes some time for the blubber layer to develop in the newborn calf. This requires the newborn to continuously swim, or its lack of buoyancy would cause it to sink uncontrollably. Pollutants in the ocean concentrate in the dolphin's blubber. A high concentration of ocean pollutants in the blubber appears to negatively affect the animal's health and reproductive rate. Because the ocean is 800 times more dense than air (due to the salt concentration in the water), streamlining is necessary for the dolphin to move efficiently through its marine environment. It is able to swim up to 22 miles per hour in short bursts because (1) its body is "fusi-form" or bullet-shaped with a pointed "rostrum" about 3 inches in length, (2) its muscular peduncle and upward stroke of its tail flukes provide powerful forward motion, and (3) in small fragments, it continually sheds the other layer of skin to help keep the skin surface smooth, parasite-free, and drag-resistant. The rate with which dolphins shed their skin is 9 times faster than the same process in man. Some people confuse the dolphin with the porpoise. Porpoises are smaller animals with a flatter rostrum and lack the fusi-form shape of the dolphin. They have spade-shaped teeth instead of the cone-shaped teeth of the dolphin. The porpoise's neck vertebrae are fused, unlike the 5 jointed neck vertebrae of the bottlenose dolphin, keeping the porpoise from tilting its head from side to side and up and down like the bottlenose. Jointed neck vertebrae are unique to the bottlenose and not found in most other species of dolphins. The Atlantic Bottlenose Dolphin's color may be gray, gray-green, gray-brown or black, with a lighter pink to white color on the lower (ventral) side. This coloration pattern of darker on the top and lighter on the bottom is called "counter-shading" (see the counter-shading page in this web site). Animals that live near the shore tend to be smaller in size and lighter in color. Animals living off shore tend to be larger and darker with smaller flippers. Various color patterns of lighter and darker gray may be present on the bottlenose's melon, providing one means of individual identification in the wild.